Anna in Prada for the Met Gala 2012. Photo by Larry Busacca. 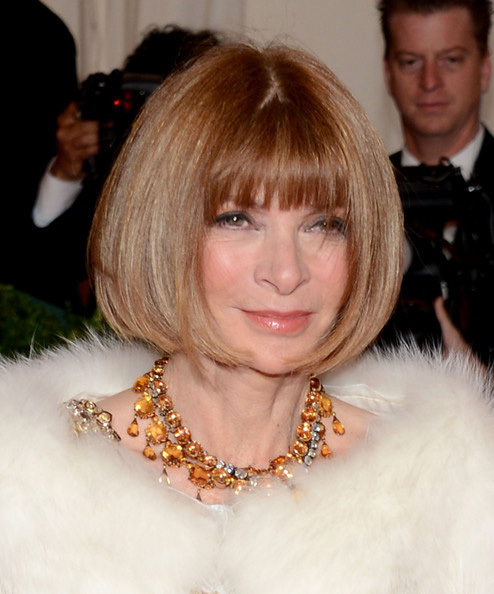 I thought it would be fun to recap what Vogue Editor in Chief Anna Wintour wore last week to the Met’s Costume Institute Gala to celebrate the opening of Schiaparelli & Prada: Impossible Conversations. It’s no surprise that she opted for Prada instead of the Chanel she usually favors for the Gala and I loved the wink-wink aspect of her dress—it is Miuccia Prada’s rendition of Elsa Schiaparelli’s iconic “Lobster” dress. What a gorgeous evening ensemble. Photo by Dimitrios Kambouris. I'm dying over the necklaces, the capelet and the perfect hair! Photo by Dimitrios Kambouris. In Prada’s version, the lobster, in heavy beading, winds around the dress, and you can see in the detail shot that sizeable stones in different shades of topaz and gold were used. To complete the look Anna added a white fur capelet—I’m not sure if it’s by Prada but knowing Anna it’s probably real fur—and her stack of Georgian-era gemstone collet necklaces. Amazing beading on the dress. Photo by Dimitrios Kambouris. 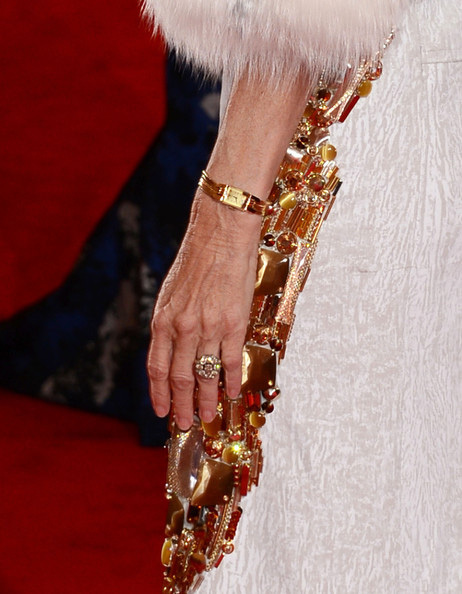 Detail of the dress and Anna's watch and ring. Photo by Dimitrios Kambouris. The lobster is also a dress strap. Anna with Miuccia Prada. Photo by WWD. For the after party, obviously a more casual affair (and who knew there was an after party? ), she wore this lovely black print dress with a circle skirt. I’ll bet it was Prada. I love this dress for the after party. Photo by Bauer Griffin. Earlier in the day, when I saw her at the press preview for the exhibit she wore a fabulous green geometric-patterned jacket and skirt, also by Prada, with her old standby Manolo Blahnik heels. Anna with her assistant at the end of the press preview. Photo by me! One photographer yelled, "Anna, quick fashion shot?" And she obliged. By Simon Russell. Anna with Met director Thomas P. Campbell. And that's me in the background, in blue! What did you think of Anna’s look? I do love how she wears her necklaces. I'd love to get my hands on one of those beauties! To be confident and know the fashion industry like she does must make it easy getting dressed for a gala. She's smiling in so many of these pictures...haven't seen that before! Her clothes are fabulous...I just wonder if she has ever been truly joyful...I hope so..she has lead a dream career-life! What a fabulous post on Anna - LOVE her look! And I cannot stop myself from looking at the photos of her stunning necklaces over and over again. They are breathtaking! I love the suit best of all...though the jewels she wore for the red carpet are beautiful. And, how cool, to be in the same frame with Anna. What a gown! The lobster is quite something with those sizeable gems - great going getting that shot of her! She is the ultimate power dresser but she always looks great to me! How fun to be there!